I was just reading Bob F's article about marine lighting and found it curious that he suggests using one type of bulb for almost any marine system. He suggests (i use this term loosely), that using the vita-lite supreme will work for most people with smaller depth of tanks. My current set up is a 90 gallon (48x18x18) and I was told to use T5 HO lighting (from GLO), which I then purchased from my LFS. I only bought a two-bulb system because I'm starting small with some mushroom corals and Zoas as well as some fish. Could I have gotten away with just purchasing some of the Vita-Lites and would these be just as well suited for other types of coral (LPS, SPS, etc)? I know a lot of people like the idea of spending a lot of money on MH when (from what I've read) it is rather unnecessary for my kind of set up, but I'm just looking to get it right. Some clarification would be nice if I'm way off-base. One of the major investments in a marine system is the lighting fixture, both up-front and ongoing/operational. I've seen set-ups where the lighting rig costs exceed the rest of the system combined. This emphasis doesn't seem unreasonable; after all, humans are visually-orienting organisms. Additionally, there are photosynthetic needs in systems that have more than fishes in them; and even piscine vertebrates require light energy (as do we) for good health. But what an ocean of controversy and expense is here! Follow along with me here; there really is no need for confusion. Light and lighting only concerns consideration of 1) quality 2) quantity and 3) duration. The latter is simply a matter of employing inexpensive timers. The two former measures can be artificially generated by common technologies. What functionally providing adequate (or more) light energy to a system involves is a summing up of what your desired livestock range/tolerance is, and what you're willing to commit financially to buying and running the source. As to the "other side" of lighting choices, esthetics; here again you'll have to figure in your own sensitivities of what's good looking with how much you have to spend. Being a conscientious marine aquarist requires understanding the difference between function/aesthetic, or what works versus what looks good. Who: All aquarists and marine systems are wanting an artificial light source. For the enjoyment of viewers, and the health of the viewed. It is self-evident that with all the differing types of salt habitats, tropical/cool/cold-water, fish/invertebrate/reef, static/open/tide-pool, shallow/mid-water/deep ... that there are various lighting regimens present in the "wild" habitats of organisms we keep in captivity. Happily, most display a wide range of adaptability to aquarium conditions, including lighting. Fish-only and fish and/or non-photosynthetic invertebrate systems can get by on regular low illumination provided by full-spectrum lighting alone. The more 'reef'-like set-ups that incorporate hermatypic corals, algae, vascular plants, live-rock, and invertebrate life that house endo-symbiotic algae (there is surprisingly a lot) in their diversity, require more watts of full-spectrum light nourishment. There are several novel, experimental ways to 'shine on' your aquatic charges; incandescent, halogen, quartz... however for safety and practical purposes the two main forms of lighting available are metal halide and fluorescent. For a non-technical review of how fluorescents and metal-halides work, you're referred to the Jeffries piece in the bibliography. Have a deserved mixed reputation amongst actual users, especially in their use on reef systems. Various "explanations" for difficulties in their use include improper bulb choice, placement, shielding, and specimen placement... all can cause real problems. I have rancoured and cautioned on the proper utilization of these "sun" replicaters. They are not cheap to acquire or energize, and can be difficult for their owners in terms of waste heat and ultraviolet light production. Despite all their potential and actual pitfalls, metal halides are here to stay. 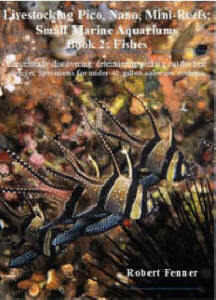 They do produce great quantities of lumens, and a gorgeous 'shimmering' appearance underwater. Used properly by themselves or in concert with fluorescents they are the closest mimics to better-than-natural lighting for captive systems. My three gripes with metal halides are 1) their inherent costs, 2) safety, efficacy of use concerns, and 3) the fact that full-spectrum fluorescents will give you the quality and quantity of electro-magnetic-radiation for much less cost and hassle. Be all the above shortcomings as they may, it would be remiss to not elucidate (fancy Latin term for "throwing light on") further on metal halides. Be wary of quartz-halogen and other halides that have color temperatures (see Section 3) B) Lighting) of 5,000 Kelvin or less. These are deficient in necessary blue-end spectra. This limitation can be made up with actinic (tm) or equivalent fluorescents supplementation. Of fixtures is a matter of experimentation. On the one hand it is desirable to locate the lamps as close as practical to the water's surface to maximize light penetration, reduce diffusion, reflection. On the other, depending on wattage, your water may overheat (quickly), requiring countervailing methods; water chilling, fans for the fixture(s)... Most units are a few to several hundred, up to a thousand watts. Imagine blowing a hair dryer continuously over the surface of your system. Some UV "A" range is useful, necessary for some light-using life; "B" and "C" are dangerous/harmful. UV "C" is absorbed by the planet's celebrated ozone layer; within it's band, 257 nm is the energy produced by UV sterilizers. UV "B" can be halted by glass and water, is very destructive to nucleic acids (life) and photosynthetic activity. UV "A" is effectively filtered out for the most part by special filters and bulb coatings provided by manufacturers. I only will install and address the use of metal halides with the use of UV filters, even though they may coated/engineered to be used without them. This added protection against radiation poisoning may require more shielding action and periodic cleaning, but is well worth the "cost" in preventing you and your livestock from "burning". Also of concern is the explosive effect of these 'high-pressure' light sources getting splashed, broken by splashing water, or cumulative bubble-mist. Is a concern principally with reef-building corals. This sensitive tissue-grade life is easily overly-illuminated by the "super-nova" equipped aquarist. Without traveling to the specific localities to assess what sort of conditions your individuals were living under, it is hard to match them. Accommodation is best achieved by "starting" newcomers at the deepest, more-shaded areas of the system, slowly moving them upward to where they seem to most flourish. Yes, you are directed to consult with reference works that describe natural habitats for given genera, species. Please see my comments below in discussing fluorescents and luminosity (brightness). Other aspects of biology must be spoken of in the use of metal halides. Due to increased photosynthesis, often many more times than occurs in the wild, the toxic effects of high oxygen concentration, nutrient depletion must be countered... High pH is countered with the use of buffers (calcareous water/kalkvasser, et al.) and/or better CO2 infusion (with a meter and doser), skimming, live rock. Pumping your system light-wise will do you no good, indeed very likely will work against you if you are unwilling to consequently fight/feed the effects of intense illumination. For most metal-halides is somewhere between 10,000 and 20,000 hours. For loss of spectral integrity and brightness reasons they should be switched out once a year. Do check your manufacturers figures, and record in two places the inception date, scheduled time for replacement of your lamps. Are by far the most appropriate, best available technology for practically lighting your system. You will find authors (e.g. Nilsen) who are 180 degrees out from this opinion; read them, and decide for yourself. Types of fluorescent lamps abound. 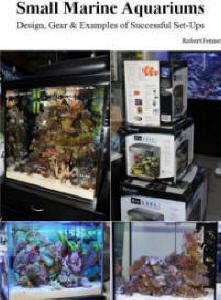 Note that the majority of lamps sold specifically for aquarium use are not useful for their intended functions. Plant-growing, warm, and "broad" spectrum fluorescents are a bad joke for marine (and freshwater) systems. Be real clear about this. You only want full-spectrum lamps. All others will not produce all the wavelengths you want and need. Full-spectrum fluorescents are available in a variety of lengths and wattages in three formats: regular, High-Output (HO), and Very-High-Output (VHO) formats. The other-than-regular types require special ballasts, end caps, holders and fixture pins, burn out and phase shift more quickly. Their popularity in use is due to greater luminosity; a regular 48" lamp is defined as 40 watts of power, VO is normally 60 watts, and VHO can range from 110-160. Respective luminosities (initially) are 2-3000 for regulars and up to 9,000 for HO and VHO depending on wattage and make. For all types there are new "electronic' ballasts on the market that you definitely want to employ. These modern marvels utilize solid-state architecture, run much cooler than tar types, extending lamp life, discounting phase-shift, saving electricity, and reducing waste heat production. What's more, you can set them up on dimmer controls to duplicate (here's a new word for you) crepuscular conditions; and save big money on high-heat end caps and lamp holders. Yay. For regular full-spectrum fluorescent lamps is @15,000 to 20,000 hours, but due to phase shift and lumen depreciation should be cycled out every year or so. They may still come "on" and look like new, but they're not. With electronic ballasts, VO and VHO types can go nine to twelve months. Label all with an indelible marker on insertion and rotate out on a periodic (as opposed to all at once) basis. 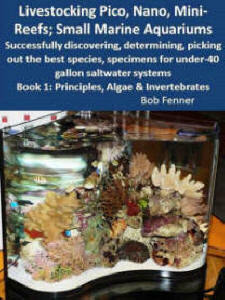 Various writers have cited measurements of incidental insolation (sunlight) taken around the world's reefs. Take a look at the materials and methods of the source of this raw data. Often, these quanta are taken above or just below the oceans surface, on days you and I would like to go diving; that is when it's calm and clear. I have traveled and written for the sport diving industry and consumer magazines for over twenty years, and can testify that there are many days when the water where corals, giant clams, et al. hail from is neither still nor very transparent. In captive systems, powered only by full-spectrum fluorescents, I have noted parallel growth rates and appearances to those in the wild. A general rule of thumb, given by many sources, for lighting wattages is 3-5 watts per gallon; maybe more for deeper tanks. This can be arranged with banks of fluorescents; perhaps with different CRI's to give a dawn, day, dusk cyclicity. Be careful with whatever lighting array you settle on that temperatures not be made to vacillate wildly or exceed 84 degrees Fahrenheit as a consequence. Whether they be box, pendant, hanging, side-angled... must be composed of non-rotting materials, shielded against the effects of splash and spray, and be... reflective. There are stock and after-market sheets and coatings that will bounce, focus, otherwise redirect the light energy down into the system. If you make your own, employ these to optimize your lighting efforts and heat-shield the rest of the fixture. Delbeek, J. Charles. Reef aquariums: lighting (a successful search for the best lighting system requires knowledge of the natural history of marine invertebrates. AFM 5/90. Nilsen, Alf Jacob. The successful coral reef aquarium, pt. 2: light. FAMA 10/90. Watts, Mark. 1995. Reef lighting, before you shop, know this. Aquarium Fish Magazine 7/95.